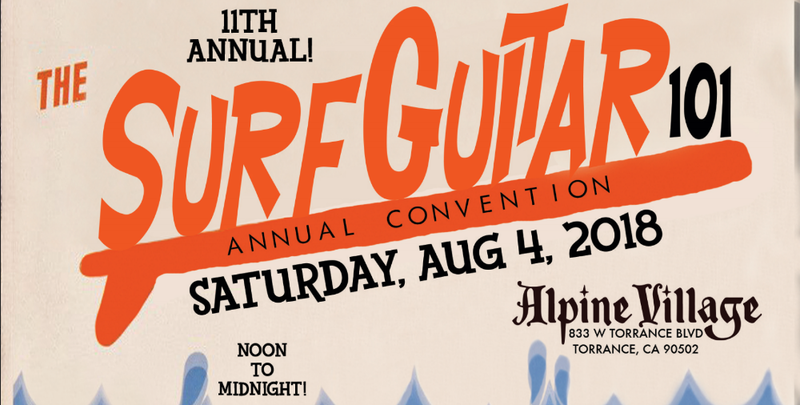 Another Surfguitar101 Convention in the books and I’m starting to feel like I’m getting the hang of things. I’m not as outgoing as one might think from the radio show, and though I’m clearly surrounded by people with like interests, I’ve been nervous about wedging myself into the scene. Which is ridiculous, because I’m already part of it, just on the internet. This year was much better in that that regard, with a few familiar faces and bolstered by the fact that everyone I ever have met at Surfguitar101 has been super warm and seem genuinely happy to meet me. I wanted to do this one a bit bigger. I wanted to catch at least one of the concerts beforehand, I wanted to catch some of Sunday. Things were thrown off-kilter when I discovered that my drivers license had gone missing somewhere between the New Orleans airport and the Hertz rent-a-car at LAX. While it is a valid question, the phrase “Do you know where you lost it?” sounds infuriatingly stupid when you’re frustrated and you don’t have a clue. “Sure, I lost it at Gate 2C and forgot to find it!” My Thursday night was spent running around the airport before finally giving up and resigning to ridesharing for the rest of the trip. Arrived at my friend’s place to crash around 1:30am instead of 9pm. On the bright side it was a good way to adjust to the time zone. For those that are members of the Surfguitar101.com forums, user remora1 extended a welcome BBQ Friday afternoon at his home in San Pedro. It wasn’t a big thing, probably only 15 people or so, but it was great to have a low-key start where I could sit down and meet & greet. It really helped warm up the whole weekend for me. I talked more about bands and records than I had in either of the previous years and left feeling like I had a bit more of a crew, even if I don’t remember everybody’s names. 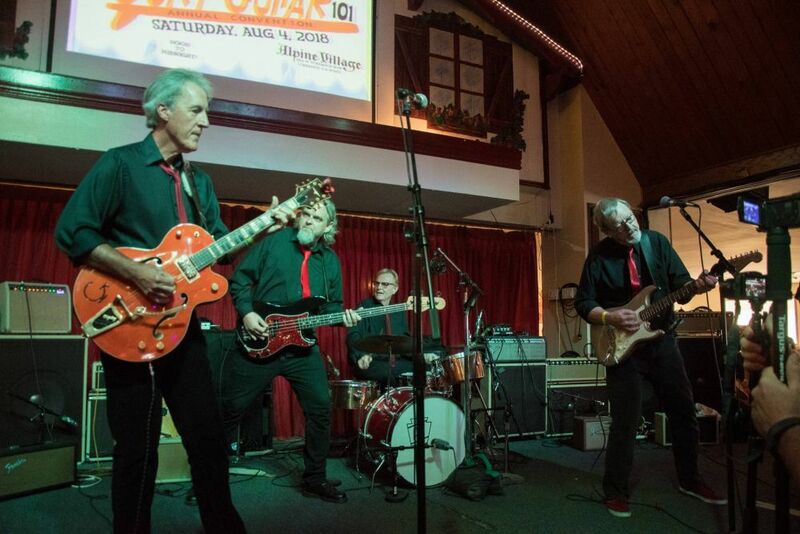 While Surfguitar101 used to be two nights, a small set of four bands at Purple Orchid in El Segundo is the official pre-show event this year. The venue’s great: the area’s nice with a few restaurants around and the lighting and decorating of the Purple Orchid tiki bar were a lot of fun. The place was tiny, with people constantly squeezing by each other and a small stage but it felt alive. For somebody that lives in a place with zero surf presence, it’s downright unsettling to walk into a place and see people wearing shirts that say Insect Surfers, Satan’s Pilgrims, etc. As somebody not used to being around others that share an interest in surf, it felt like a prank show. I was most excited about the first act: The Blackball Bandits. I had been a fan of this band since their first bandcamp demo and I thought they nailed this year’s Double Crown debut. They were also the only band on the bill that would not be performing the following night. The stage (roughly as big as two billiards tables side-by-side) was not really ideal for handling a 5-piece, but that was also kind of great. I got a sense that the bandits were playing with a “whatever, let’s roll with it” attitude, and that goofy upbeat vibe permeated into the crowd. They opened with a couple of punchy numbers off of their new LP, bouncing around with their black and white striped shirts vibrating inches from each other adding a visual energy along with the sonic energy. The sound wasn’t perfect -- don’t get me wrong, I love sax and he did a great job, but it was a bit too high in the mix -- but that energy carried it through. They broke into a few covers: a loud and proud Comanche (that my surf-noob buddy recognized from Pulp Fiction) and Squad Car with the sax doing the sirens. I’d say the latter experiment was a bit of a hot mess considering how loud the sax was, but like the best hot messes everybody was smiling. They came back a little slower, eventually hitting their medley of Morricone classics. While the album cut of that was one of my favorite, I think I enjoyed their newer songs most. All in all, I’m so glad that I caught them, and it bolstered my enthusiasm for this crew. I didn’t stick around for the whole show, just the Urban Surf Kings’ set after that (I think my friend was burning out). We’ll save the USK commentary for the actual convention. I tried to get to the Alpine Village promptly when doors opened at 11am -- last year I missed out on some great vinyl sold by Bob Dalley and I didn’t want to make the same mistake again. Unfortunately the door crew wasn’t quite ready so I figured I would stock up on money dollars while I waited for the go-ahead. The ATM inside only did $40 at a time, and the ATM at the gas station was out of money. Not sure how people solved that conundrum but I ended up paying $2 to get into the swap meet outside and using their ATM. Didn’t buy anything from that swap meet but there was a U-Turn Orbit Turntable out there that I bet was a steal! When I did get in I certainly wasn’t the first, but I managed to snag a lot of stuff I was really hoping would show up at this. Lee from Dionysus had the new Hang-Ten Hangmen LP and the new Jason Lee and the RIP Tides as well as a 10” from the Surfin’ Beards and a Dragtones LP (Mike Barbwire’s Rockabilly outfit with a few instros). Art from Musick had a lot of Messer Chups vinyl that I passed on, but I did pick up Svetlana’s 7” under the name The Bleak Engineers as well as a Men from SPECTRE 7”. Ferenc from Frankie and the Poolboys was selling a bunch of CDs for so cheap that I almost forgot to pick up the Ewa on the Beach 7”, and right next to him the fellas from Tikiyaki 5-O had their new EP. Bob Dalley was there again -- didn’t have as much heat as last year but I picked up some great 7”s from some 90’s surf bands like the Arousers and Sir Bald Diddley. He also had reissues of his Surf Raiders CDs and, of course, his excellent book. I was also really happy to find the 2017 release from the Tormentos, which I had listened to on bandcamp but couldn’t find a place to buy. There’s one other vendor whose name escapes me but always has absolutely great, often hard-to-find CDs that helps me fill in holes in my collection. Later in the show John Blair would show up with copies of Reverb Nation: the recording of last year’s convention and I also managed to snag one of the limited advance copies of the John Blair anthology soon to be released on Bear Family. He had his reissues of the Nightriders’ Live at Whiskey A Go-Go but I had my original. It was a pretty huge haul and I probably spent wayyy too much. This year also included the Tiki Loft, with plenty of vendors selling tiki items upstairs. I did a quick peruse but I’m afraid I was already way over my spending limit. I love the name of these guys and I’d given their new EP a listen but not enough to really digest it. However, I’d read some great impressions from people that had seen shows earlier that week, and I was looking forward to seeing what they had in store. The name is appropriate though, as they’ve got a moody, progressive take on the genre, with some effective use of guitar effects that I’d never heard before. They impressed in flashes, and I got a feeling that with more familiarity with their songs I’d be liking it even more. It’s funny coming to California to see bands that are much closer to my neck of the woods. King Pelican hails from San Antonio about 8 hours away and we’d even exchanged emails about setting up a show in New Orleans but things fell through on my end. It was great seeing them live and plugged into that fantastic array of amps; they had a lot more oomph and crunch to their sound than comes across on their recordings and they certainly didn’t feel limited as a trio. They’re great showmen, even to a crowd that was still trickling in and their on-stage chemistry was apparent and hard not to crack a smile at. The Black Flamingos do such a great job of injecting darkness into a surf party vibe, and those strengths were only amplified in person. And while I meant that from a purely sonic perspective, it could be applied to their performing style as well, everybody clothed in black, bassist with sunglasses on, and their guitarist never speaking a word (Vincent on Drums handled all mic duties between songs) and yet they were a blast to watch, with plenty of energy in their playing. Somehow I hadn’t realized despite several emails exchanged with Vincent, that he (and his wife) run the constantly growing Hi-Tide label and that he was in The Black Flamingos, and it was great to meet them in person after the set. If there was a mid-day headliner, these guys were it for me (they were likely put this early in the lineup due to the fact that it was in the wee hours of the morning in their time zone). Les Agamemnonz records have tapped into a different vein of surf -- familiar yet unmistakably their own in a way that’s hard to nail down. Their rhythms tiptoe strangely and hypnotically and they seem mostly unconcerned with the electric strength of guitar, sometimes dipping into chicha territory. This was before I knew anything about them live, and the landscape-focused packaging of their albums gave few cues. Within a few minutes I had decided: if I could join any band performing at this convention, it would be these guys. They come onstage wearing different colored togas (in the drummer’s case, just a way-too-big T-shirt) and barefoot and jump around in an aimless, careless manner that really just broadcasts that they’re into what they’re doing, and I was into it too. It wasn’t all aimless -- there were some synchronized guitarist formations and rotations reminding me of those videos of the Spotnicks, but then there was also a guitarist seated at the side of the stage while his bandmate solos. Really, they just looked like they were having fun. They also won major points with me by covering my favorite Ventures tune “Go-Go Dancer” (which is SUCH a good fit for their sound). While I’d love to talk about the music first, the most striking part of the performance was Rev Hank’s goofy grin, clearly having a ball up there. I know I’ve said this a few times (and I’ll say it again), but hearing them loud and live gave them some grit that I didn’t expect from the albums. I heard a few things that I recognized, including “Tesla Re:Coil” from their brand new one Astro Surf A Go-Go, but I haven’t gotten too familiar with that album yet and they’ve got a LOT of back catalog so it’s hard to say whether they stuck to it. I didn’t hear it at the convention, but at the Purple Orchid they pulled out a surf version of Star Wars theme that had been shoehorned very well into a surf structure, to the point where it took me second to recognize it. Meant to chat with them at some point, but it didn’t happen. I finally found an empty table and I desperately needed to eat, and since the waitress took a break after I got my food I was bound to my seat for this entire set, so no pictures. The jaegersnitzel was lovely though, especially with a little salt. The beginning of the set was inarguably one of the most powerful moments of the event. Paul Johnson has been a frequent guest at SG101 but unfortunately he had to miss his own tribute due to a battle with Leukemia. Dave “Insect Surfers” Arnson had visited him the day before and recorded a message from Paul to the crowd, played back on Dave’s cell phone. Paul was upbeat but didn’t sugarcoat it, saying “One of us is going to be the winner, either me or the disease, and it’s gonna be me.” He didn’t dwell on it, he mostly expressed how he wanted to be there and impressed upon us how unique of an event SG101 is. The lineup included John Blair, Matt Quilter, Dave Wronski, and members of the Mach IV (apologies to anybody I’ve forgotten, my memory doesn’t work well without pictures). There were a number of PJ and the Galaxies tunes including my favorites “Tally Ho” and “Lanky Bones” and then it transitioned to a number of tunes that are among his favorites, which got a lot more buzzy/fuzzy than you’d think! It ended with a great Link Wray medley. It was a really great set and I wish I could have been seeing it up close. But eating food is nice. 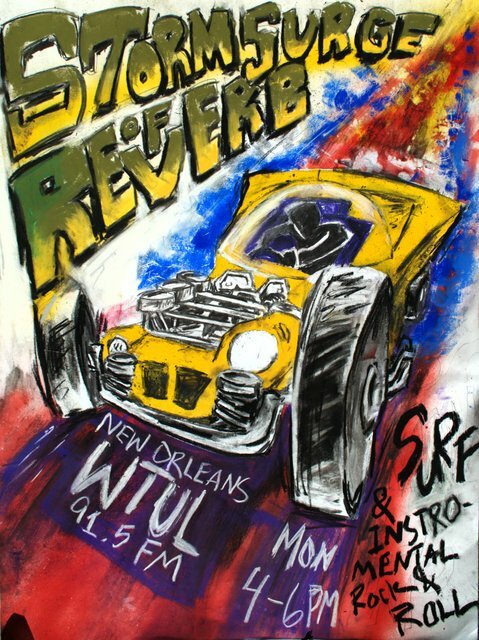 I really enjoyed the Surfaris tribute last year, hearing those songs played loud in SoCal with John Blair giving it a musicological approach. Very similar treatment here and with a band that I absolutely love. They opened with “Big Surf” which sounded great: huge and loud like it oughta be. John apologized for not playing on similar instruments to the Sentinals, saying that it’ll likely sound a bit more “surfed up”, and while I absolutely enjoyed it all it didn’t have some of the “thunk” that I love in the Sentinals’ recordings. What was present, however, was some of that unique percussion, with the saxophonist bringing in some wood blocks. It was a short set with only 10 songs but leaving little to be desired. They even played a rare 45 “The Bee” that had me wanting to unplug John’s mic as he introduced it since I had a bid on a copy on eBay. I didn’t win it. As with the Surfaris, John did a great job of helping us learn more about the Sentinals, for instance clueing us in about Latin’ia’s influence from Santo & Johnny’s “Slave Girl”. I don’t know if these tributes stand out to potential attendees as much as visiting bands, but I always love them. If anybody was going to put up a fight in the goofball grin category vs Rev Hank, it’s Ferenc. He came on stage rocking back and forth, grill stretched wide, looking like he's having a blast. Frankie & the Pool Boys have just released their new (excellent) album Spin the Bottle and their set stuck to it pretty closely for the most part. For once, here’s a group that sounded very close to what I expected from the album, and that’s a both a toast to the production quality of the record and the band (especially considering that from what I understand, one of the guitarists was a fill-in!). The stylings of the songs on that album are pretty diverse, and I’m always really impressed at the snarl of the meaner surf & instros when they can slide right back to a light-hearted groover. On those dancing numbers the keyboard really shines, and it’s really striking how rarely that instrument is seen at this event. As the set came to a close they switched gears a bit, dipping into Ferenc’s legacy by playing Pollo Del Mar’s “Flash of Green” and bringing Mel Waldorf on for a medley of The Cruel Sea and Surf Party, two of my favorite classic surf songs. So yeah, maybe if they were wearing matching red suits I would have realized that these were members of The Huntington Cads -- you know, the ones that headlined last year? The ones I took a bunch of photos of and spent a while editing? Anyway, they were paired up with the guitarist from Los Kahunas and members of The Finks to form this group and playing some songs from each band as well as a few that belonged to none of them. I don’t think anybody was complaining about hearing an encore performance from the Cads, but I was pretty delighted to hear the Los Kahunas songs. Last year when the Atomic Moquitos played, I thought “yeah I like this band but I don’t know if I know their material well enough” only to find that I knew and loved almost everything they played. I had a similar experience here, my ears perking up to “6G15” and “Another Summer Song”. It’s not surprising why thesebands got in touch -- they’ve got similar styles and they’re great at crafting a memorable melody. It was great to finally get a chance to meet and hear Lorenzo “Surfer Joe” Valdambrini in person, though I really hope to see him on his home turf in Livorno. Hopefully soon. Lorenzo is also supporting a brand new LP called “Swell of Dwell” and though he played a number of songs off of it, he didn’t stick to it entirely, including songs from The Wadadli Riders and "Astrobeat" from the Astronauts tribute split LP with the Kilaueas -- a tune we probably would have heard last year were it not for for problems at the border. This was another case where hearing these songs live transformed them and gave them a lot more force -- the whole set was supercharged with power. Lorenzo’s got charisma by the boatload and his sense of humor came through from start to finish. This was the band that sealed the deal when I saw the lineup and reports from those that had seen them in the earlier shows that week had me really excited. Their loud, howling, hollow sound stood out to me bigtime when I was first getting into this music, and I couldn’t wait. I planted myself dead center as soon as Lorenzo was wrapping up and held it down. After a lengthy setup including crash cymbals set up as hi-hats, four smoke machines, and a lighting adjustment from that underwater blue-green to a harsh red, they were ready to go. Despite years of familiarity and several albums, I honestly can’t recall a single song they played (it helps when you cheat and take pictures of the setlist, but I didn’t see it). I guess I dropped the journalistic mindset and let myself jam. I’ll say that it was better than I hoped. The show was absolutely wild and looked as good as it sounded. They kept it pretty businesslike, not much in the way of talking between songs, just slamming on guitar. While the pictures came out a little messier than I’d hope, I think they do the talking pretty well. I’d heard some comments about how they left a bad taste in some people’s mouths, that they focused a little too much on their european sense of cool. I guess I see it, they were certainly a different approach than most groups at this convention and they were far from a trad group. But they were the highlight of the night for me. I’d heard some hype about getting the Blue Hawaiians as the headliner but I wasn’t sold. My engine was running out of steam, and their jazzy, cool surf sound didn’t seem like it would reignite it. I was wrong, they were the perfect band to end with: their cooler sound didn’t demand much from the listener and closed out the night with a powerful spell. But more importantly, this was not the band I expected. I don’t know if they’ve meddled with the formula over the years or whether hearing it in this context was different than the albums, but this felt so much more progressive and thought-provoking than the loungey surf hybrid I knew them by. At this event full of talented guitarists, somehow their lead guitarist raised my eyebrows more than anybody else. Total skill in not just technical proficiency, but discretion and musical instinct, and that goes for everybody in the band. They were taking pretty well-worn songs like “Beat Girl” and “Our Man Flynt” and making them feel new and interesting. It all came to a silly climax with a long-haired dude named “Crazy Al” jumping on stage and performing what was likely the only solo on the coconuts I’d ever witnessed. Was that intended? Not sure, whatever, they went with it and it made it all the stranger and better. While I had planned to attend the show at Surf Dogs and scheduled a later flight to accommodate for it, I ended up getting to to the airport super early to accommodate for my lost ID instead. Totally unnecessary, only took me 15 minutes to get through. Well damn. Moreso than missing another opportunity to see the bands (I hear Tremolo Beer Gut did their Sonic Youth cover/my Halloween show favorite “Death Valley ‘69”), I was bummed that I missed out on more time to catch up with my peers. 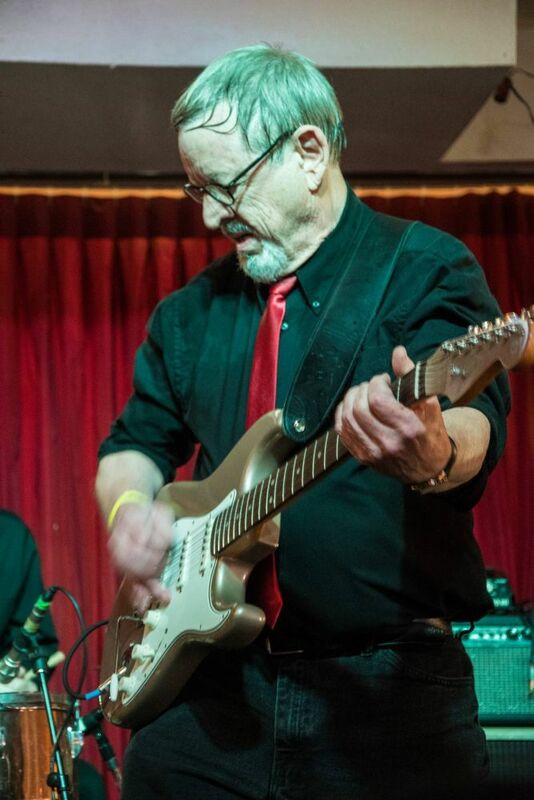 I did much better in that respect this year, particularly pleased to have gotten to hang out with people like Arno de Cea, Danny Snyder, members of the Delstroyers and Blackball Bandits, DJs like Cousin Mary, Bill Raser and Guy Moore…. But there are a lot of people, some who I had chatted with in previous years, that I didn’t get a chance to even say Hi to. If you’re one of those people, really bummed about that, hope to catch you next year. Anyway, it was another great year for SG101 and I want to thank Jeff and everybody else that made this happen. It’s not just about cool music, it’s important for me to be able to pull in and really see what it is that I spend so much time engaged with from afar. This is a great community, and I’m proud to contribute in my own way.